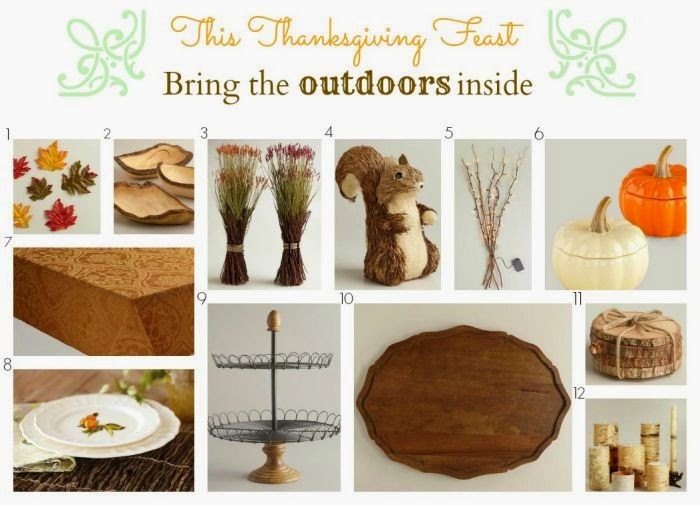 Beautiful Incentives: Bring the outdoors inside for your Thanksgiving decor. Plus, Win and Give back! Bring the outdoors inside for your Thanksgiving decor. Plus, Win and Give back! Ahh, Thanksgiving. The time when you really feel like you can let go in all things. Let go of your problems and worries, let go of ...well let's not lie, let go of your diet and any inhibitions. Drinks anyone? How about a nice glass of white or red wine? You're sitting down warm and cozy, to a golden brown Thanksgiving tablescape, surrounded by nothing but wood and nature. Grab your beautiful stemmed glass full of wine sitting on the rustic wooden coaster, that looks as if you cut fresh wood to craft it yourself. Take a sip and swoosh it around. Special Thanks goes out to World Market for inspiring me and sponsoring this discussion in the form of a gift card. The bark encompassed candles are lit, their light dancing around the table and smiling guests faces. The glowing branches in the corner bring an ambiance of peace and tranquility and the light directs your eyes across the golden table, as the whimsical sparkle of the leaves strewn across it make you wonder if fairies left their marks. A little squirrel is avidly waiting by the cutting board for the feast to begin. Your eyes are drawn to a two tiered desert holder and you admire it's unique design, while you can't help but wonder what will be on it. Does that sound like the kind of Thanksgiving you want this year? I know that is what's going down in my place. A veritable wood nymph gathering for a feast. Whatever you would like to call it, it's something that would suit almost anyone. Especially those who really appreciate nature, but not the freezing cold while you eat your dinner. No one wants to bundle up in coats to eat. I am excited for the traditional foods, but I am very fond of the ambiance as a whole. I think it is important that you make your guests feel totally at ease. Holiday entertaining should be nothing too fancy, but also nothing you'd find at your local bbq joint. Unfortunately, the sobering reality is a lot of people in this world cannot enjoy a Thanksgiving with so many comforting amenities. Some won't have turkey or anything to commemorate the Holidays. This is why we need to give to those who aren't as lucky as us right now. For those that are having a much harder time. We need to give back. Join me in sharing the joy for yourself and others this Holiday. 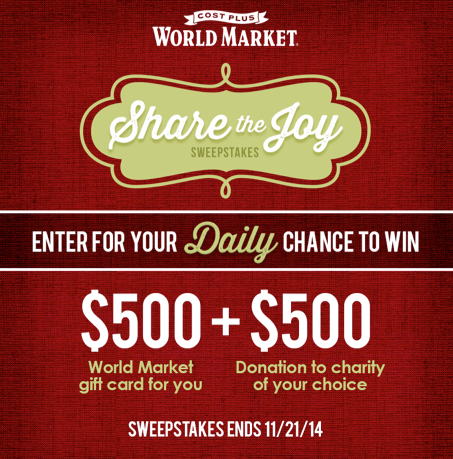 Enter the World Market Share the Joy Sweeps here for your chance to win $500 and another $500 for a charity of your choice! picture with a specific hashtag (#ShareTheJoy_WM & #WorldMarketSweepsEntry) telling us how you are Sharing the Joy this holiday season. A $50 World Market gift card will given away per day as well! Photos must be tagged #ShareTheJoy_WM and #WorldMarketSweepsEntry for giveaway consideration. very cute! I love this time of year and the decor, thanks for this! We do not have a world market around here. But this is a great way to bring the outdoors in! Always a fun thing to do! I'm loving the glittered leaves. That's such a cute idea for table decor on Thanksgiving! And the Wood Bark Coasters? Lovely! I'm definitely looking into those. <3 I also want to comment on how well-written this was and how much I enjoyed reading. Thank you for reading Emily! It has been a while since I created a scenery with words. It was fun. World Market has such unique products don't they? Who doesn't want glittered leaves ? ?